The Intrinsic Colour Collection Water Based Wood Dye is a range of 12 unique colours. Black – build up to a deep Black with several coats. Burnt Orange – a dark orange, on the orangey side of brown. Earth – Warm brown, described as the colour of drying mud. Flame – A bright yellow orange. Forest Green – Quite dark, similar to Jade. Honey – A bold, glorious yellow. Midnight Blue – Deep blue with a hint of purple. Plum – Adds a royal expense to your work. Ruby – Deep and opulent dark red. Stone Blue – A fairly bright blue. Straw – Rich yellow/green, imagine grass. 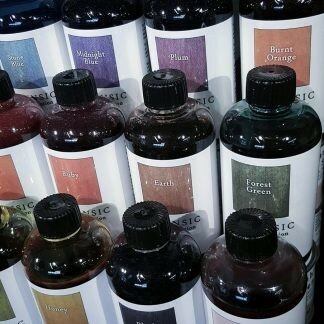 The colours can be blended or used as a wash.
Sold in 250ml bottles individually. An optional Spray Cap is also available for the 250ml bottles only. 12x 150ml bottles. Features every colour. 12x 15ml, pre mixed sample bottles of every every colour.